My current book reading is The New Kings of Nonfiction, a collection edited by my This American Life hero, Ira Glass (who oddly has no self maintained online presence I can find). It’s a collection of stories that weave in the kind of storytelling and interest TAL conjures, from the published world of reporting where the story elements are often sifted out. .. for a surprising number of reporters, the stagecraft of telling a story– managing its fable-like qualities– is not of secondary concern, but a kind of mumbo jumbo that serious-minded people don’t get caught up in. Taking delight in this part of the job, from their perspective, has little place in our important work as journalists. Another public radio officemate at the time- a Columbia University School of Journalism grad–would come back from the field with funny, vivid anecdotes she’d tell us in the hallway. Few of them ever appeared in her reports, which were dry as bones and hard to listen to. There’s a whole school of reporters– especially ones who went to journalism school– who have a strange kind of religious conviction about this. They actually get indignant; it’s an affront to them when a reporter tries to amuse himself and his audience. I say phooey to that. This book says phooey to that. I like books that say phooey. 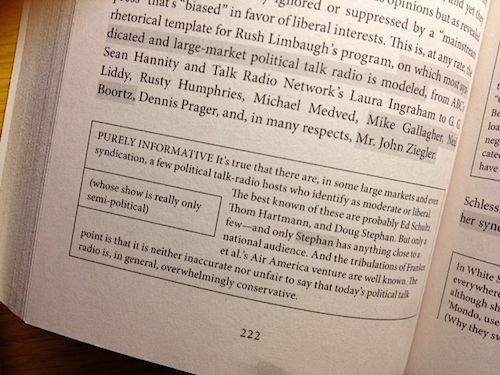 A chapter I was just reading, called simply “Host”, has been bubbling in my fore lobes, some because of the connections to ds106 radio, but also for this mix that occurs with the writer, David Foster Wallace, and his subject- political talk radio provocateur, John Zielger. Wallace writes with this mixture of curiosity and disdain for his subject, but the latter does not get in the way of the former. What is interesting is how Foster has woven his commentary into an interesting structure of hypertext in print, pages have highlighted text which one infers to follow to the nearest call out box, and sometimes within there are sub links. I was torn between whether this was disruptive or helpful, but in the end it fit the multilayered aspects of the story, there was the story on the main stage, but this kind of running commentary (I expect the first comment on this post will tell me to read Infinite Jest, already noted, ok?). 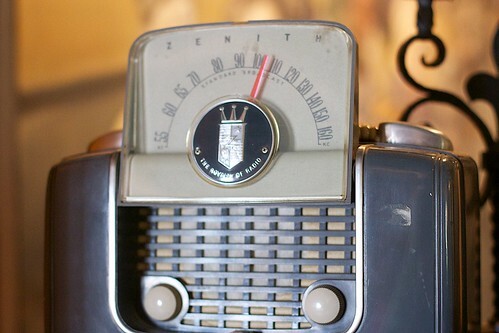 FCC regulations require a station ID to be broadcast every hour. This ID comprises a station’s call letters, band and frequency, and the radio market it ius licensed to serve. Just about every serious commercial station (which KFI very much is) appends to its ID a Sweeper, which is the little tag line by which the station wishes to be known. In a way this is interesting twist on the re-use of popular culture in perhaps different contexts than the artists might have written them. The story highlights the audio wizardry that goes on behind the scenes, an operating system for managing content called “Prophet” (like ds106’s Centovacast), how a staff member constantly monitors the sound levels to keep at perfect amounts to prevent peaking. This is a challenge on ds106radio as often the levels from different sources vary dramatically. We live with that. Also radio calls “flub” what we typically call “futzing”. I think you get it. And there was a whole fascinating description of this audio device they call “The Cashbox”- since all “live” radio is on a 7 second delay, an audio box (Akai DD1000 Magneto Optical Disk Recorder) allows engineers to actually remove smal; bits of blank space or slightly speed up sound so you may not even hear it, enabling them to squeeze a 20 minute segment into 19. That may sound like trifling, but they are driven by the amount of time given to advertisers, and every second becomes precious. Everything unspoken about you, your topic, and how you feel about it has to be conveyed through pitch, volume, tone, and pacing. The pacing is especially important. From my experience on the ds106radio, this rings true as to the level of energy, with one important distinction/advantage we have- we do get the live feed back through twitter, our audience is mostly/usually known to us. This in fact is one of the most fun and interesting parts. It is not broadcasting into the space of nothingness. But a host’s persona is not the same as outright acting. For the most part. it’s probably moer like the wat we are slightly different with some people than we are with others. There was way more to this story than these bits, but I got a lot out of this understanding of commercial radio, and the dynamics in place there (and have no doubts about it, talk radio is big business- as Wallace writes, it’s not about ideology, its about making money). Though I would add one small detail- in #ds106radio many broadcasters didn’t know anyone really in the audience; it was through the listening & broadcasting experience that many new friends were found. Where lots of TAL fans must feel like they “know” Ira Glass, he never gets the opportunity to then listen to his audience, not just through twitter in text, but rather switching the broadcast-audience dynamic as individuals from the audience, in turn, take the mic and become the broadcaster. That detail aside, I still find this fascinating. Love your juxtaposition of the #ds106radio experience against other “professional” radio art forms. You know I love me some radio. So I’ll read the Glass book and also the DFW (I didn’t know he did a piece on radio). Wallace’s little clock-and-talk-to-an-empty-room experiment is a good one. That’s pretty much what it feels like in pro-land, as I recall. Backtime–meaning you count back from the time you have to hit, typically the top of the hour news or a particular program segment coming over the network, and choose music, spots (commercials), and talk (weather, sports, gab, etc.) that’ll take you right up to that moment. When the backtime works right, it sounds like everything is choreographed perfectly, right to the second. It’s kind of a rush, actually. I once did a great backtime and had no less than Dean Olsher himself (a colleague at that time at WUNC-FM) congratulate me and offer me a slice of pizza as a reward. BTW, Google Dean Olsher. He’s a very, very talented radio guy a la Glass, Ari Daniel Shapiro, etc. Stepping on the vocal: you do NOT want to be talking when the vocalist begins to sing. You want to HIT the vocal, not step on it. The drama and excitement should never let up. Puking: an exaggerated “DJ” voice where everything sounds like it’s coming from the back of the throat, half swallowed and half belched and half emetic splendor. Front announce: say the name of the song/artist at the beginning. Reading the meters: taking readings from the transmitter meters, as per FCC requirements (at least, it was required back in the day). Riding the gain: manually adjusting sound levels to keep the peaks up around 80-95% but not above 100%. Rip and read: tear the latest news from the roll of paper on the AP teletype (aka “wire), head into the studio, and read it. Stop set/spot set: the series of commercials (spots) that you’d play in between music. Typically four or five of these an hour. The log: the typed sheet that said which commercials ran at which times. The DJ would note that the commercials ran when they were supposed to. Cueing up a record: putting a vinyl record (or sometimes an endless-loop tape cartridge) on standby, ready to play. For vinyl, typically for 45 rpm singles, the jock would (on the cue or aux channel, see below) turn on the turntable, place the stylus in the lead-in groove, play the record right up to the first sound, stop the tt, and manually rotate the record back until the stylus was just far enough back from the first sound to allow the TT to come up to speed when it was time to play the record. Cue burn: when a record had been cued up several times, esp if the vinyl was cheap, you’d be able to hear a loud fffffffffffffff during the part that had been, essentially, dug out by the cueing. Slip cue: letting the TT turn beneath the cued-up record as the record “slipped” on top of the platter. The idea was that the record would come up to speed almost instantly, since the TT was already turning. Segue: the transition from one program element to another. Typically this refers to the transition from one song to another. A great segue is like a great metaphor or a great rhyme: it keeps the flow going but makes a surprising connection. Cue or Aux channel (sometimes “preview channel”): a channel on the board that let the DJ hear what was coming next without broadcasting it over the air. Cueing up records, listening to countdowns at the network, etc. required this channel. On the Gates boards I used most often, you listened to the Aux channel by turning the pot (the volume control) on an input all the way down, then clicking down one more step. The click down made the source play through the aux channel. That’s enough for now–the memories are really cascading…. “Gardner Comments” its like getting a whole blog post right here-, thanks for the terminology run down deluxe! I fondly remember our walking around NYC doing some live #ds106 radio and you described the music “bed” that many people picked up. Cant wait to hear YOU again on the radio. Fantastic post Alan – definitely going to check this book out. The terminology list from Gardner is a solid gold nugget of radiolore – great resource for future #ds106 student forays into radio/audio projects.